Legend has it that the Wisdom Tree (or as some call it the Magic Tree) on the summit of Burbank Peak was the only tree left standing after a devastating wildfire fire in 2007 burned more than 817 acres in and around Griffith Park, including Dante’s View and Captain’s Roost. 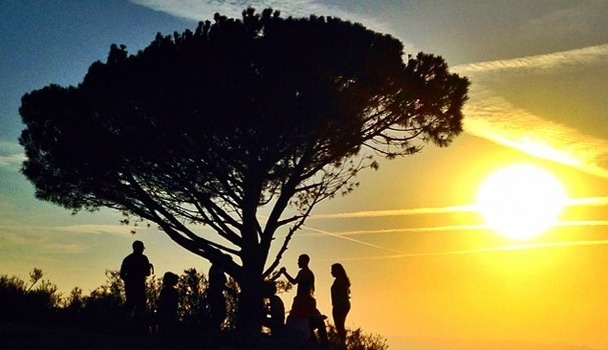 Today the tree stands as not only a testament of endurance, but a glorious viewpoint where hikers have the chance catch a truly epic glimpse of the city of angels. With Burbank to the north, and Hollywood and the rest of L.A.’s urban sprawl set to the south, the expansive view is framed perfectly with the stunning tree in the foreground. Some say you can even see all the way to Catalina Island on a clear day. Keep in mind once you’re at the summit of Burbank Peak you have to option to head back down the trail from whence you came, or continue along to hit up Cahuenga Peak, and then eventually Mt. Lee and the Hollywood Sign. Whether you decide to just go to the tree or all the way to the sign, you should know that most of the elevation gain happens within the first mile, and it’s a pretty demanding incline, so novices ought to beware. – Steep inclined trail may keep more novice hikers away. It’s a 740′ elevation gain in about 3/4 of a mile up to Burbank Peak. As always, wear hike appropriate footwear. – Not well shaded, so bring plenty of water and sunscreen. – Bring a notepad and a pen you can leave a note in the tree for future visitors! – To get to the trailhead take Lake Hollywood Drive east from Barham Blvd. Follow this road through the hills until you see Wonder View Drive. – There is no parking at the trail head (marked as Wonder View Trail on Google Maps) but there is ample parking on Lake Hollywood Drive and you can hike the short distance to the trail. Map is embedded below. – For a full step-by-step guide to trail, check out Casey Schreiner’s write-up on Modern Hiker. If you want more We Like L.A. content and updates on upcoming events, be sure to subscribe to our email list below!